These Christmas-time prayers for little children explore the story of Christmas night and its message of good news. The simple words-and-responses of these evocative rhymes will make prayer time a sharing time. - Publisher Designed to make bedtime prayers a special time for sharing, the Nightlights series features rhyming prayers that children should enjoy repeating. This companion volume to "Safe This Night" explores the story of Christmas night and its message of good news. 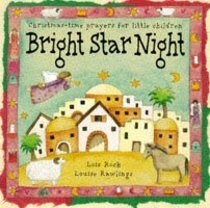 About "Nightlights: Bright Star Night"
Designed to make bedtime prayers a special time for sharing, the Nightlights series features rhyming prayers that children should enjoy repeating. This companion volume to "Safe This Night" explores the story of Christmas night and its message of good news.